When Envestnet acquired data aggregator Yodlee in mid-2015 for $590 million, mixed feelings and heated opinions were flying high. Some felt that this was a brilliant move that would augment Envestnet’s capabilities. Others frowned on the transaction citing the 50% premium as unreasonable and anticipating integration issues. A year after the deal was announced, how is the power couple faring? Better than the critics predicted, according to John Bird (Yodlee’s Senior Vice President for Product Marketing and Alliances) and Colby Payne (Senior Director of Product Management). The duo led the “Yodlee Deep Dive” session at the Envestnet Advisor Summit. They offered insight into the fit between the two companies and a look behind the scenes into new features that could revolutionize wealth management and the way that advice is delivered to investors. One new feature that Yodlee subscribers will soon see is predictive analytics paired with real-time alerts. The result is a step towards a more robust personal financial management (PFM) tool that approaches the functionality of a personal financial assistant. Payne referred to it as “micro-advice”: interactions and recommendations at the transaction level that can provide another level of user engagement. Thanks to transactional data that goes beyond investments and extends into credit cards, bank accounts and even loans, the potential benefits of holistic advice are compounded. With expenses, insurance, and Social Security details available, advisors can offer exceptionally well-informed advice to their clients at the right time. Yodlee’s predictive analytics can look at spending and income patterns and provide useful alerts such as when a client might run out of cash, Colby proposed. This gives an advisor exceptional insights into an upcoming need to liquidate assets. It also presents a coaching opportunity to bring the client back to his financial goals. For example, the algorithm can flag excessive cash outflows for entertainment expenses. An alert can go out to the client warning him about specific ways in which a change in spending habits will affect his retirement timeline. There is nothing wrong with an expensive shoe habit as long as the client understands it could delay his retirement, noted Bird. The predictive analytics functionality is currently in development and Alpha testing is expected to start July. No date was available for when these features will be available in production. Whenever they are available, it will be accessible via Yodlee’s REST API infrastructure. Any customer alerts must be built into the banking institution’s environment. The APIs would allow a bank or other financial institution to deliver a seamless mobile experience for a customer to see a Yodlee-driven alert for an NSF risk and then elect to transfer funds to prevent the overdraft. I have not seen anything like this in any other mobile banking app. It is a new market for Envestnet to tap and could be a major source of revenue. They can also cross sell existing Yodlee banking clients with their premium wealth management solutions. From the asset manager’s standpoint, Yodlee is a hook that enables relationships and creates engagement. Advisors can begin with a robo offering, and use the data to build trust with timely advice as the client grows into the advisor relationship. Visibility into available cash and investments help elsewhere can help advisors grow their share of the client’s wallet and offer more holistic advice in compliance with the new fiduciary rule. Yodlee strives to be an enabler of better financial decisions for their clients. The big picture is useful, but most clients want advice packaged in digestible bites. 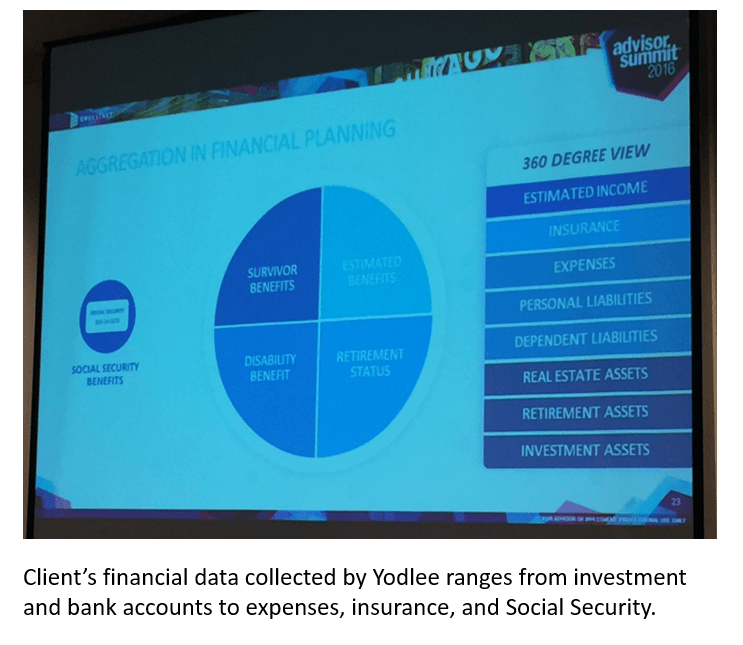 From saving for a goal to monthly budgeting, Yodlee set out to develop its own PFM application that will help clients achieve their financial goals one small step at a time. As consumers come to expect a more holistic view of their financial lives, data aggregators have more pull to request data from institutions. Historically, Yodlee has had the most difficulty getting traction at the esoteric institutions that service a small number of retirement accounts. This is something that Bird referred to as “long tail”. It seems that public demand combined with a patient approach to banks’ concerns is making more direct feeds available. With the upcoming release of new functionality, all Yodlee subscribers will benefit from improved visibility into the financial lives of their clients. Yodlee’s goal is to become a holistic household-level financial enabler. The API update will take place in two phases. Phase 1 in July will include all banking and investment information. Phase 2 in October will line up available options for advisor’s review and offer deeper workflow integration. It is interesting that Yodlee seems to view Envestnet as one of its clients for the purposes of the upcoming updates. When Yodlee and Envestnet announced the acquisition last year, a question on many minds was, “What will happen to Yodlee’s clients outside Envestnet?” Looks like Envestnet is getting no preferential treatment. There is no shortage of stories where financial institutions are blocking data aggregators’ access to their clients’ data. The relationship between banks and data aggregators has been tense with J. P. Morgan Chase, Wells Fargo, and Bank of America taking steps towards cutting the data flow. Where does Yodlee stand on this data access debate? No big surprise there. During the session, Bird was forceful about his belief that data is owned by the investor – not the institution. In his words, Yodlee is an advocate for consumers against financial institutions that try to limit their access. Emphatically delivered from the conference stage, this position may come across as adversarial. In reality Yodlee has a unique way of dealing with institutions that are reluctant to give access. The secret Yodlee way does not involve lawsuits. Instead, the aggregator falls back on a patient and persistent education process. Yodlee begins with the premise that banks want the same thing as Yodlee – to put customers first. Banks just have a different way of going about it. Their primary concern is not the aggregator’s business model or resulting commoditization of services. It’s security. In the past, many data aggregators were getting their information through screen scraping: capturing log-in information to get access to data. This practice created spikes in volume of access to bank websites and exposed customers to account fraud and identity theft. Yodlee is different with 73% of its data coming from direct feeds, but banks have no way of knowing that in the beginning of a relationship. The Yodlee teams tries to support the bank’s preference and address underlying concerns to facilitate a win-win outcome. The approach takes time and patience but can be effective. Five years ago, the largest provider of private label credit cards in the US blocked all data aggregators. Consumers were unable access their credit card data via any third party application. Yodlee approached the firm’s legal department last year in order to work out some kind of agreement to lift the blockade. They explain their approach to security and offered to undergo an audit in an effort to get them to open up access. It took around 10 months, but Yodlee ultimately prevailed and signed a contract to permit data aggregation. Patience and collaboration, backed by consumer demand, are a powerful combination. With the upcoming July API Phase 1 release that will enhance Yodlee data flow to subscriber platforms, advisors can expect improved functionality for monitoring available assets and allocations. Insight into cash flows will drive alerts on advisors’ dashboards, facilitating client outreach based on real-time data. For example, Yodlee can identify 401(k) accounts with no contributions in over 90 days no matter who services those accounts. That effectively flags clients who may have changed jobs. The advisor gets a dashboard prompt him to reach out to the client and offer rollover services. This is a move that was obvious from the moment Envestnet announced the Yodlee acquisition. Data aggregation services can actually be quite expensive, but the cost savings is a drop in the bucket compared to what they spent for the technology. Still, there is no reason to use external vendors when you have the same or better functionality available in house. Leaving aside the turbulent relationship between banks and aggregators, there is no denying that data aggregation is here and getting better. Yodlee, CashEdge (now Fiserv), Morningstar’s ByAllAccounts, and newcomers like Quovo are all completing to provide the best data and the most robust analytics to power decisions. Acquisitions in this area are coming on fast, and the pool of independent aggregators is dwindling. Nine months after the Envestnet-Yodlee acquisition, analysts continue to question the value of the deal. Envestnet’s stock price has not fully recovered. It also seems that Envestnet is not getting preferential treatment over legacy Yodlee clients. Based on the conference session, Yodlee’s focus on providing reliable and actionable data is impressive. The upcoming Phase 1 API release is expected to improve advisor insights, and the Phase 2 release in October will bring deeper integration into the advisor workflow. The integration of the two companies appears to be creating the expected synergies. Envestnet is betting that their clients will pay for the opportunity to capture greater wallet share through digital engagement.